These Jalepeno Turkey Burgers with Avocado Dill Sauce are light, summery, and so delicious. It’s finally starting to feel like spring here in Dallas, and I’m loving every 70 degree and sunny minute. The only problem is it’s going to fly by and the next thing I know, we’ll be feeling that summa summa summatime heat. Soo.. let’s soak it all up while we can. As you may have noticed, i’m obsessed with all things Dill right now. I had some leftover from earlier this week, so decided to make a quick creamy avocado dill sauce to top the burgers with. It takes less than 5 minutes to make and is so flavorful. I decided to serve these turkey burgers sans buns, but feel free to grill up a bun and go on your merry way. In a medium bowl, combine ground turkey, jalepeno, onion, garlic, bread crumbs, worcestershire sauce, salt, pepper, oregano, and egg. Mix until just combined and then shape the mix into 4 even size burger patties. Preheat the outdoor grill or grill pan to high. Grill burgers over medium heat until cooked through, 5-7 minutes per side. To prepare sauce, add all ingredients to food processor and pulse until smooth. Store in the fridge until ready to serve. To assemble, add turkey burger to lightly grilled bun or lettuce cup, followed by toppings of choice and a big dollop of avocado dill sauce. EAT! You guys know I love a good quick & easy weeknight meal. This Panko Crusted Chicken with Arugula Salad is just that! I made the dressing ahead of time, so the entire meal took me less than 20 minutes. Simply dip each chicken breast (either pounded slightly with a meat mallet or purchased already thinly sliced) into flour, then egg, then the panko mixture. Then transfer each chicken breast to a hot skillet with a generous amount of oil. The oil is what’s going to help it crisp up, so make sure you have a few tablespoons swirled into the pan; add more as needed. I used Chosen Foods Avocado Oil because it has a higher smoke point than olive oil, however, you could still use olive oil, vegetable oil, or canola oil. Once the chicken is cooked (about 4 minutes per side), transfer to a paper towel lined plate so that it can absorb any excess oil while you prep the salad. I would suggest making the dressing before you start the cooking process, so your chicken doesn’t get too cold while you prep the salad. Toss a bowl of fresh arugula with dressing and set aside. To serve, transfer chicken to a plate and top with arugula salad, shaved parmesan, and a lemon wedge. This meal is delicious on it’s own, however, you could easily add some roasted broccolini, grilled zucchini, or pesto pasta on the side. SO yum and perfect for summer! First prepare the dressing by combing first 5 ingredients in a blender or food processor and pulsing until smooth. You can also whisk all ingredients together in a bowl if you don’t want to mess with the blender. Store covered in fridge until you are ready to serve. Set up breading station using 3 shallow bowls; one with the flour, one with the egg, and one with panko, parmesan, italian seasoning, and garlic powder. Season each chicken breast generously with salt and pepper, then dredge in the flour, followed by the egg, and then the panko. Transfer to hot skillet and cook for 4 minutes per side, until golden and crispy. Keep an eye on these so they do not burn. Repeat with remaining chicken breasts. When chicken is done, transfer to a paper-towel lined plate while you prep the arugula salad. Toss a large bowl of arugula with lemon garlic dressing and shaved parmesan. Serve chicken on a plate drizzled with a lemon wedge and topped with arugula salad. Holy smokes, you guys.. this Sheetpan Eggplant Parmesan is delish to the max and most definitely one for the books! I also love how easy and hands off it is. Once you bread the eggplant, it’s easy peasy from there. We bake these guys on a sheetpan the entire time and it yeilds a cripsy, cheesy, mouthwatering dinner without having to stand over the stove and pan fry each one. Alessandro scarfed his down in a matter of minutes, and lets just say he isn’t the biggest eggplant fan so that’s really sayin’ somethin! Start by placing sliced eggplant rounds in a single later onto a paper towel lined plate. Generously season both sides with salt and let it sit for 30 -40 minutes. This causes the eggplant to sweat and will pull out excess moisture and bitterness. Preheat oven to 425 degrees and line baking sheet with foil. Spray with cooking spray or brush with olive oil. After 30 minutes or so, take a paper towel and dab each piece of eggplant until dry. Get out three shallow bowls, and put your flour in one, eggs in the second, and panko, 1/3 c parmesan, salt, pepper, italian seasoning, and garlic powder in the third. Take each piece of eggplant and lightly dredge in the flour, dip in the egg, followed by panko mixture. Place onto greased baking sheet. Repeat with remaining eggplant. Spray the tops of the eggplant with a little olive oil. Bake for 12–15 minutes, or until golden brown, flip them over, and bake another 12-15 minutes. Remove from oven and place 1-2 spoonfuls of marinara on each piece, followed by a tsp of grated parmesan and a few T of shredded mozzarella. Return sheet pan to the oven for another 12-15 minutes, until cheese is golden brown and bubbling. garnish with torn basil and dig in. Say hello to the easiest and most versatile recipe ever: INSTANT POT SALSA CHICKEN. Made in under 20 minutes and the ultimate weeknight dinner life savor. This chicken is perfect for tacos, tostadas, enchiladas, taco salads, burritos, burrito bowls, nachos, etc. Simply put the chicken breasts into the base of your instant pot, season with spices, and top with salsa. Cook on the meat/poultry function high pressure for 15 minutes. Once cooking has stopped, carefully release the pressure and remove the chicken from the pot to shred. I always shred chicken in my stand mixer because it’s literally the easiest thing ever, but you can also place it on a cutting board and shred using two forks. Drizzle with leftover sauce from the pot, top with fresh cilantro, a squeeze of lime and serve! Instant Pot Salsa Chicken- quick, easy, and versatile shredded chicken recipe. Perfect for tacos, enchiladas, salads, etc. On the table in 30 minutes or less! Place chicken breasts into the base of your instant pot and season both sides with spices and top with salsa; make sure chicken breasts are completely covered by the salsa. Cook on meat/poultry high pressure for 15 minutes. When time is up, release the pressure, and remove the lid. Transfer chicken breasts to your stand mixer or cutting board. If using stand mixer, add paddle attachment and shred on low speed until shredded. If using a cutting board, shred using two forks. Place shredded chicken into a serving bowl and drizzle with leftover sauce from the pot, fresh cilantro, and a generous squeeze of lime. Serve with tacos, tostadas, enchiladas, salads, burrito bowls, etc. This will keep in the fridge for 4-5 days. Who doesn’t LOVE a quick and easy enchilada recipe? That would be straight up silly if you said you didn’t. It had been way too long since i’d made enchiladas, so it had to happen and it had to happen NOW. 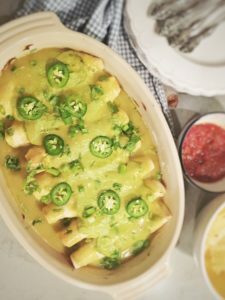 These Easy Chicken Enchiladas are definitely a new fave and are SO easy because we use rotisserie chicken and store-bought organic enchilada sauce. You could easily prep the filling ahead of time if you’re in a time crunch, and then assemble these bad boys right before you’re ready to bake them- that would take no time at all!! I used Siete Foods Almond Flour grain-free tortillas because I absolutely love love love them, however, you could easily use flour tortillas in place of these as well. Hopefully, this makes getting dinner on the table less stressful and a little more fun since they are quick, simple, & delicious!! ENJOY!! Easy, simple, and delicious weeknight chicken enchiladas! Loaded with shredded rotisserie chicken and green chiles and baked to bubbly, golden perfection! Preheat oven to 400 degrees and grease 9 x 13 in casserole dish. In a medium sized mixing bowl, combine chicken, 3/4 c enchilada sauce, green chiles, cilantro, salt, and pepper. Set aside. Heat oil in a medium sized skillet. When oil is hot, add onion and garlic and saute for 2-3 minutes. Add sauteed onion and garlic to the bowl with chicken and chiles, along with 1 1/2 c cheese. Toss to combine. Wrap tortillas in a dish towel and microwave for 20-25 seconds until warm. This helps them not break when you roll them up, however, a few cracks are totally fine. Place about 1/2 c of the filling towards the bottom half of each tortilla, tightly roll up, and place seam side down into your greased casserole dish. Repeat with remaining tortillas. Once all tortillas are rolled up and in the casserole dish, pour remaining enchilada sauce all over the tops, followed by remaining cheese. Cover and bake for 25 minutes, then uncover and bake an additional 10-12 minutes, until cheese is brown and bubbly. Remove from oven and garnish with Cilantro and serve with avocado, lime, and fresh jalapenos. Looking for healthy dinner inspo this week? This Red Curry Chicken with Cauliflower Rice is JUST what you need. I’ve now made it twice since living with my brother and sister in law and you better bet your bottom dollar I’ll be making it again before we move out. It’s SO easy, made in just one skillet and takes no longer than 30-40 minutes. It’s also jam packed with flavor and so yummy. We like serving it with cauliflower rice for a low carb weeknight meal option, but it would be oh so delish with jasmine rice as well. Hope you absolutely love this one!! Heat oil in a large skillet over medium heat. Add onion, ginger and garlic and cook until fragrant, about 1 minute. Turn heat to high and add red curry paste and cook another minute. Add chicken to the skillet; season with salt and pepper and cook until chicken is no longer pink, about 3-4 minutes. Now add broccoli, bell pepper, snap peas, baby corn, and water chestnuts; stir to combine; sauté 2-3 minutes. In a small bowl, combine soy sauce, fish sauce, and lime juice; stir. Add coconut milk, chicken broth, and soy sauce mixture to the skillet, followed by the Bok Choy. Simmer for 5-7 minutes. Sauté cauliflower rice in 1 T olive oil and 1 T ghee. Season well with salt and pepper. Serve curry over cauliflower rice (or substitute jasmine rice) and garnish with fresh cilantro and a lime wedge. These Chipotle Chicken Lettuce Cups are the perfect low carb yet extremely delicious lunch or dinner. The taco meat and chipotle crema can be prepared ahead of time and stored in the fridge until you’re ready to assemble. I would suggest re-heating the meat before serving. Hope you all had a wonderful Labor Day!! Heat 1 T avocado oil in non stick skillet. Add onion and garlic and cook 2 minutes. Now add chicken and cook, breaking up until no longer pink. Add spices and mix together. Now add chicken broth, reduce heat and simmer for another few minutes. To make chipotle crema, add all ingredients to blender and pulse until smooth. Spoon chicken mixture into butter lettuce cups and top with desired toppings!